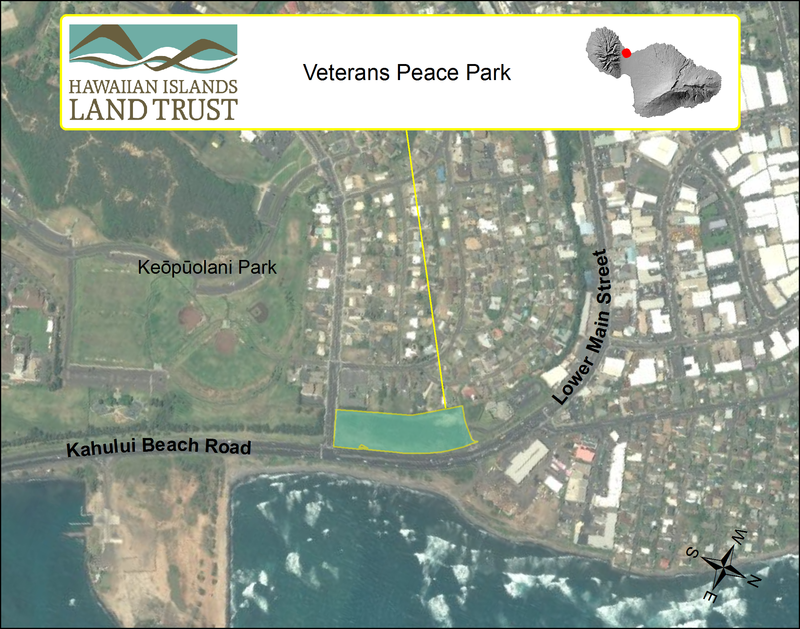 Wailuku, Maui – Today, Hawaiian Islands Land Trust (“HILT”) and the Nisei Veterans Memorial Center (“NVMC”) protected a 4.5-acre open space parcel in a densely developed section of Wailuku which will serve as a future peace park honoring veterans. The land, between the NVMC building and the Kanaloa Avenue and Kahului Beach Road intersection, was conveyed today by the NVMC to HILT. This coastal land has various conservation values which benefit the community. The parcel affords numerous passersby and residents in the area scenic vistas. The property also has historical and cultural values. There are two known historic sites on the property, including a Hawaiian cultural site and the remnants of the Kahului Railroad’s rock crusher which operated from 1921 to 1946 when the facility was damaged by a tsunami. The property also has water resource values in that the land serves as a natural filter strip from runoff heading towards Kahului Bay. The land has some wildlife habitat values and contains native plants such as naupaka. HILT will eventually open the land for public passive recreation by turning the property into a peace park honoring veterans. A nature trail, small public parking area, picnic tables, benches, and informational signage will be installed amongst other efforts on the land such as removing invasive plant species and introducing more native species. “We have been very honored to work with the Nisei Veterans Memorial Center on this project. On behalf of the Hawaiian Islands Land Trust, I want to thank the Nisei Veterans Memorial Center for donating the land to us. I also want to thank our very generous donors who gave us the funds to receive the land, build the basic park infrastructure and steward the land long-term so that this strategically located coastal property can serve as a future peace park honoring veterans. The lead gift was provided by The Freeman Foundation. Other leadership gifts were provided to us by Mary Sanford, Paul Mizoguchi, David and Judith Fukuda, Hiroshi Arisumi, Alexander and Baldwin Kokua Giving program, and Matson. I would further like to thank HILT’s Director of Conservation/Maui Island Director, Scott Fisher, for his work on the project,” said Ted Clement, HILT Executive Director. Brian Moto, NVMC President, stated, "NVMC is excited about the preservation of this open space as a peace park honoring all Maui veterans and is happy to donate the property to HILT for this purpose. We respect HILT's distinguished record of land stewardship and conservation, and believe that our collaboration will result in a lasting tribute to our veterans." About Nisei Veterans Memorial Center: The Nisei Veterans Memorial Center is a living memorial guided by the valor and values of the Nisei (second generation Japanese-American) veterans of World War II, and is committed to perpetuating their legacy through education and continuing service to all generations. Formed as a Hawaii nonprofit corporation in 1991, NVMC is located on Go For Broke Place off of Kahului Beach Road, Maui, and is home to Kansha Preschool and Maui Adult Day Care Center’s Ocean View facility. The NVMC also features an Education Center with offices, exhibit room, and an archive of Nisei veteran documents and artifacts. Contact the NVMC by email at info@nvmc.org or call 808-244-6862. Photo From left to right: Paul Mizoguchi, NVMC Treasurer, Yuki Lei Sugimura, NVMC Board, Brian Moto, NVMC President, Ted Clement, HILT Executive Director, Scott Fisher, HILT Director of Conservation/Maui Island Director, Malia Avila, HILT Office Manager, Carol Gentz, HILT Development Director. Older PostYour Kokua Is Needed to Save Land!